Having long considered myself (a) something of an amateur historian and (b) a philhellene, I’m ashamed to say I’d never even heard of Hosios Loukas (in my defense, neither had Microsoft Word’s spellcheck). This was a major oversight by both me and Bill Gates. 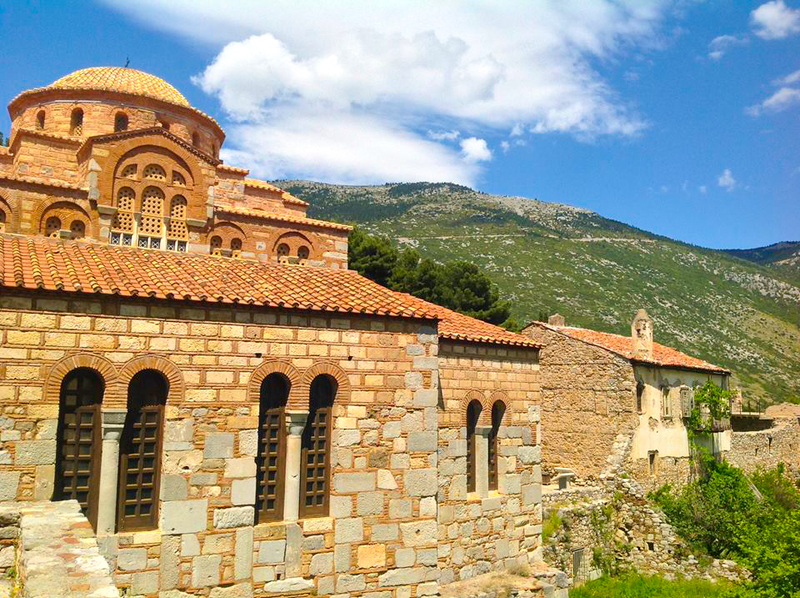 The monastery, located just minutes off the most direct route to Delphi from Athens, is one of the numerous UNESCO World Heritage Sites covered by GreekTours. 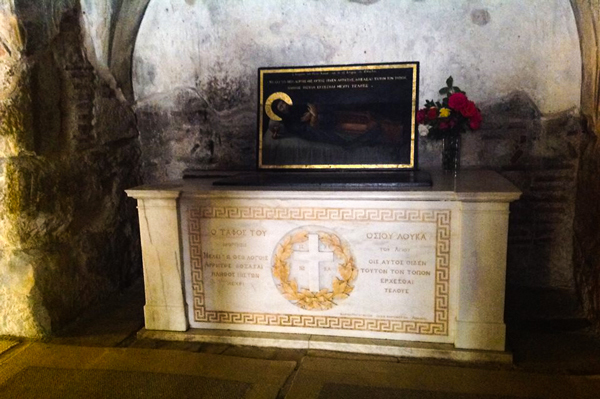 It was founded in the 10th century by Saint Luke (no, not the one with the Gospel). This Saint Luke predicted the recapture of the island of Crete from the Andalusian Muladis by the Emperor Romanos. Since Romanos died with Crete still under Muslim control it looked like Luke had blown it. However, under Romanos’ grandson Romanos the Second’s rule, the island returned to Byzantine control, and Luke was immediately jettisoned to stardom. (The critical importance of always keeping one’s forecasts vague will be reinforced later when we visit Delphi.) 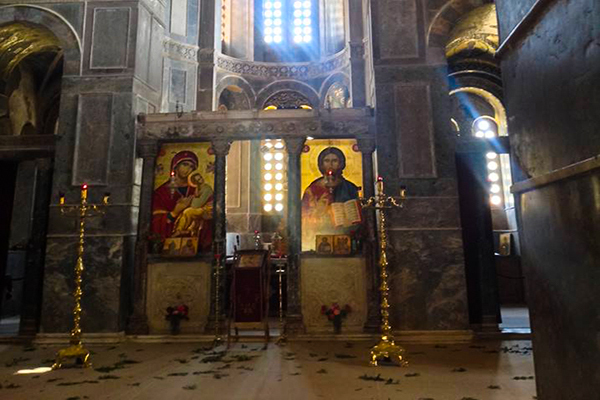 The structure of the monastery itself is a splendid example of Byzantine architecture, seemingly incorporating some materials from an earlier Classical period. Your guide will educate you on all aspects of the site you more reliably than I ever could, but I’d suggest the frescoes in the crypt are well worth seeking out while you’re there. For us, however, the most stunning aspect of the site was the beautiful views it afforded across the valley beneath it. (We were soon to learn that, frankly, sumptuous vistas were a constant feature of the Parnassus region.) Nestled in the slopes of Mount Helicon, the monastery’s lands (for the most part olive groves) sprawl beneath you as you look from its parapets. One suspects the groves are a key source of income these days, where in centuries past cash was derived from well-paying pilgrims drawn by the alleged healing properties of (among other things) Saint Luke’s own relics, damp coming from the tomb, lamp oil in the crypt and any dreams you had when sleeping in the crypt. It’s good to see the Orthodox Church was every bit as entrepreneurial in times gone by as its Western Christian competitors.